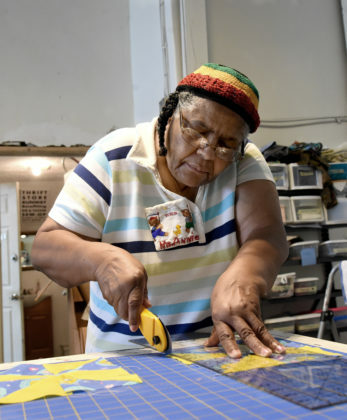 Inside Bib & Tucker Sew-Op in Avondale, there are sewing machines and fabric everywhere, along with drawing boards, tables, measuring utensils, quilts hanging on walls. 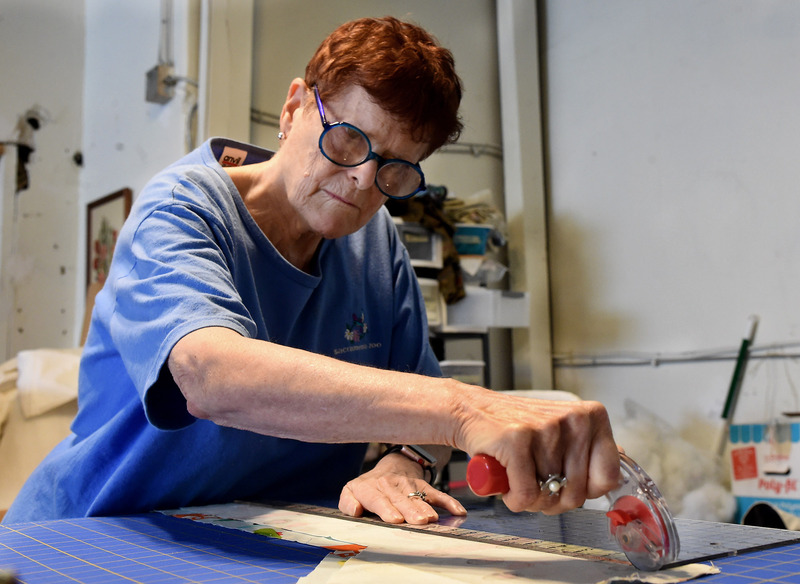 It is a space where creatives can come and work on their art, whether it is making quilts, sewing clothes, or making household items like aprons, cooking mitts, or pillows. 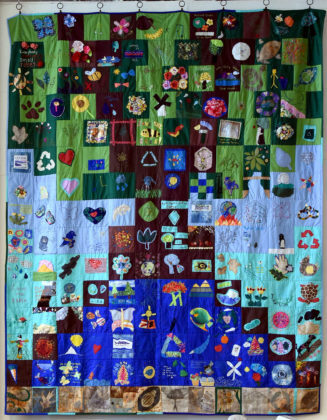 It serves an ideal place for everyone. At Bib & Tucker, members and anyone else can express their creativity through the long-standing art forms of quilting and sewing. The nonprofit organization’s mission is to cultivate skills for those who like to sew and serve as a place where everyone can be both a student and a teacher. 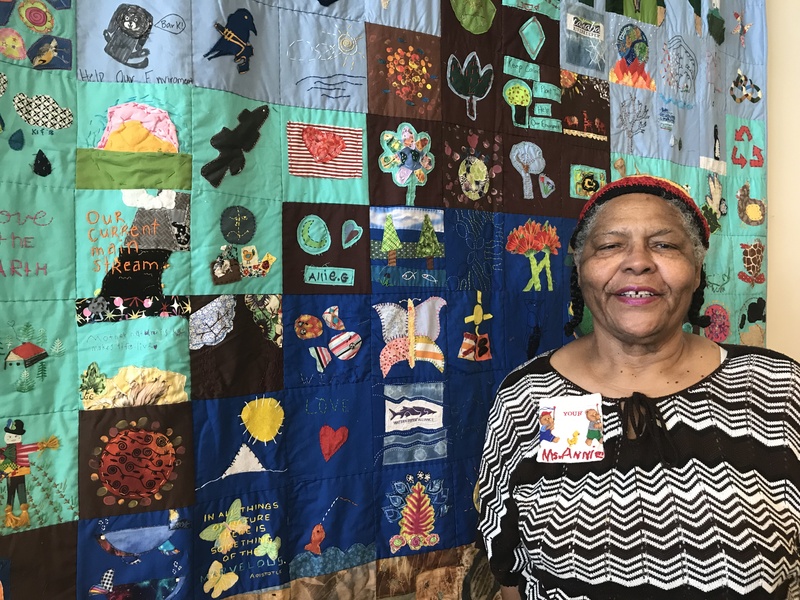 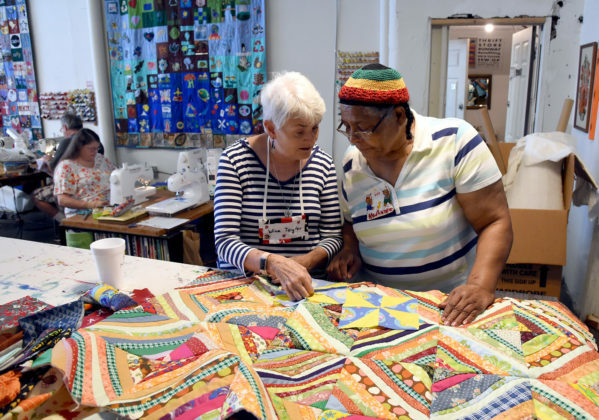 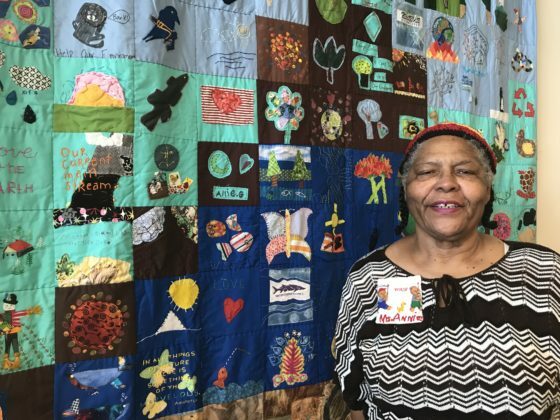 The group has about 25 members who get together weekly on Tuesdays or Thursdays for sewing and quilting classes; membership is only $5 a month. 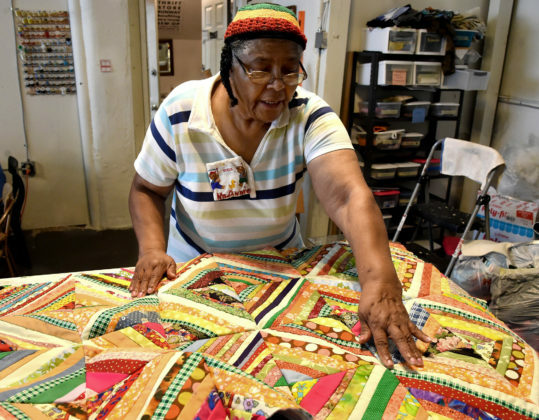 Quilting and quilts are also some things you can pass down “for generations, like I have my mother’s embroidery scissors that were my grandmother’s. 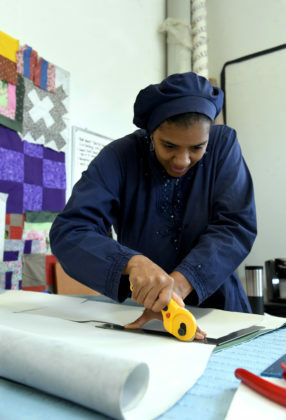 I’m going to pass that down and my sewing machine, as well,” Muhammad said. 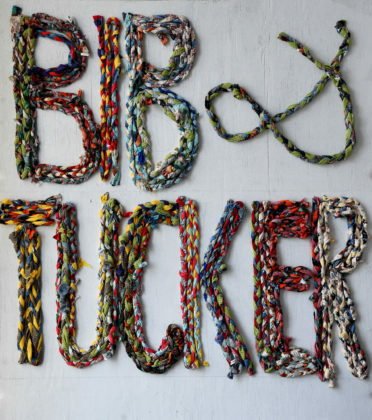 Bib & Tucker was founded in 2010 by friends Annie Bryant and Lillis Taylor, who met at a Birmingham Quilters Guild meeting. 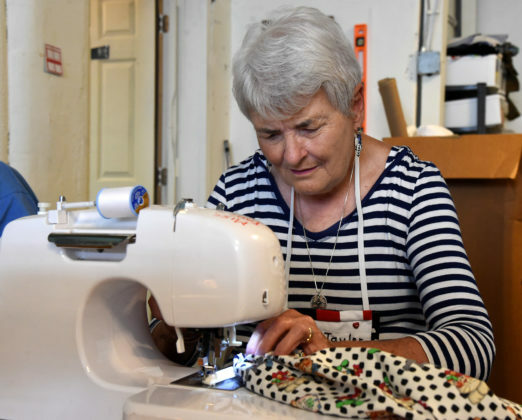 The organization’s name is from British slang meaning “the finest clothes”—women would wear blouses and skirts but then embellish their bibs and aprons to dress up their clothing. 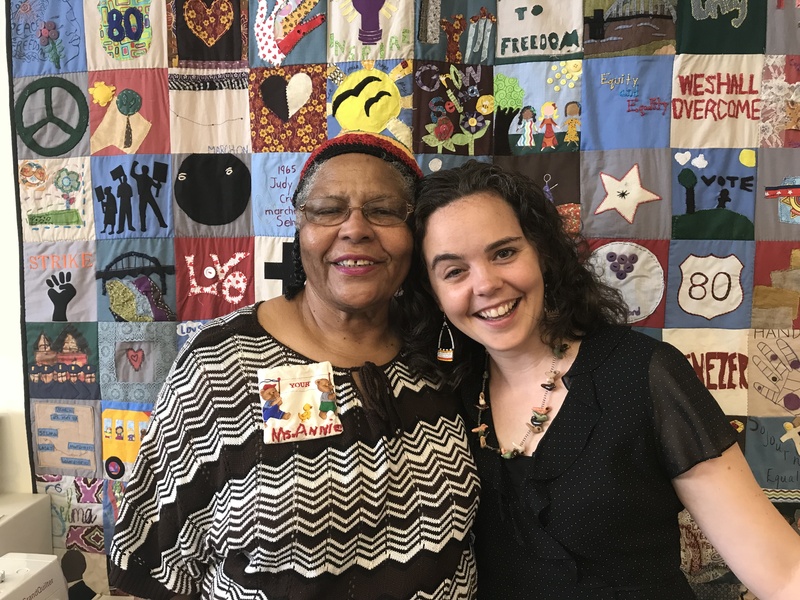 Taylor chose the name because she wanted something unusual and clothing related, and sew-op is a play on co-op because the partners wanted to create a sewing cooperative in Birmingham. Bib & Tucker not only stresses the importance of sewing and quilting as an art form but also serves as a source of empowerment. 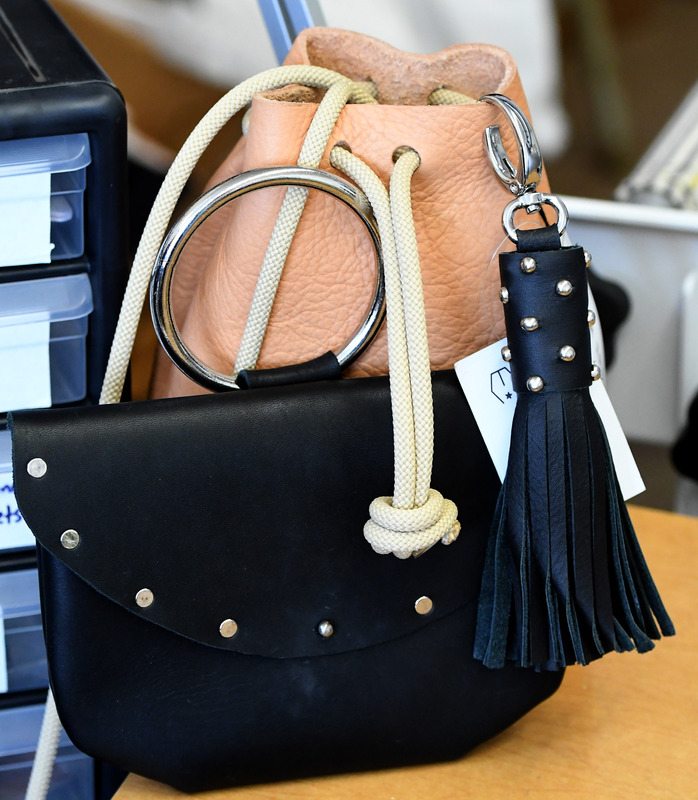 Talaya Champion—who works with Bib & Tucker through the Magic City Seams program, which equips participants with skills and provides economic opportunity—can work on her leather-accessories line and still take care of her 2-year-old daughter. 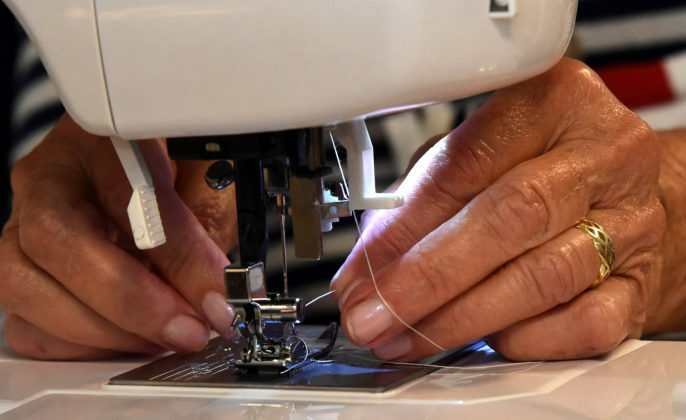 “[Bib & Tucker] teaches a skill and then [helps] women find jobs and employment opportunities because [people] don’t think of sewing as something [that can help them] make money. It feels good to be in a room that fosters creativity,” said Champion, who started her leather line, Champion Limited for men, about four years ago, and a women’s line, Ever Irene, last August. Muhammad said Champion is an example of how inspirational the sew-op can be. 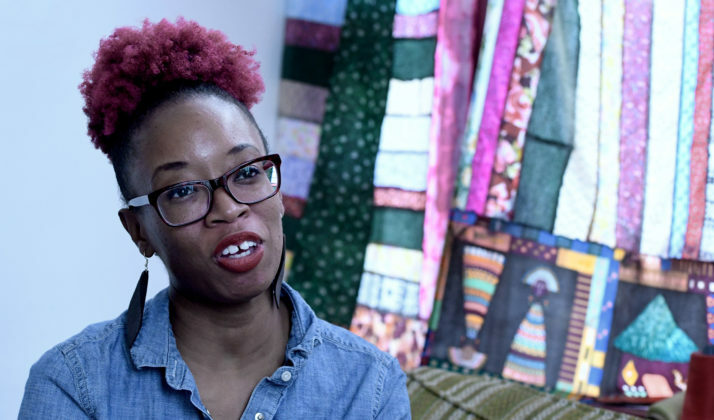 Muhammad said she enjoys working with people who see things differently. 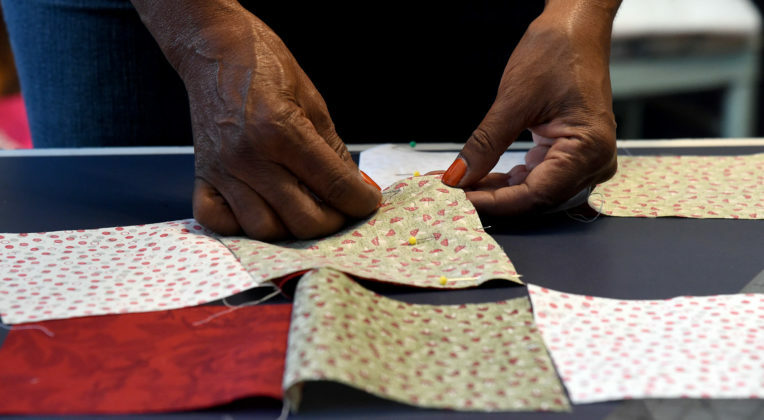 The Bib & Tucker Sew-Op has several programs designed to promote sewing activities that encourage education, empowerment, and economic opportunities. Here’s a closer look at a few of them. QUARK is a quilting-activity resource kit developed by Bib & Tucker co-founder Lillis Taylor; it teaches the fundamentals of quilting paired with the principles of math. 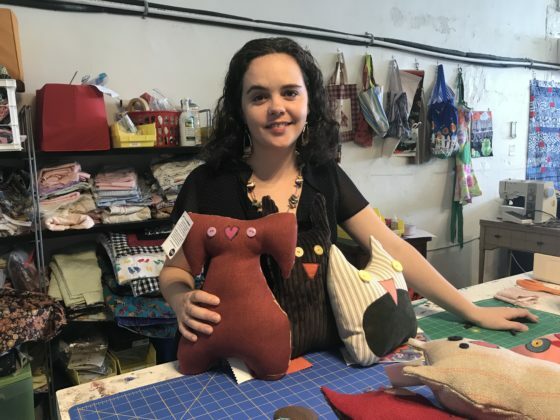 “The kit itself uses a curriculum geared to 4th through 6th graders, and it can be used by teachers in the classroom. 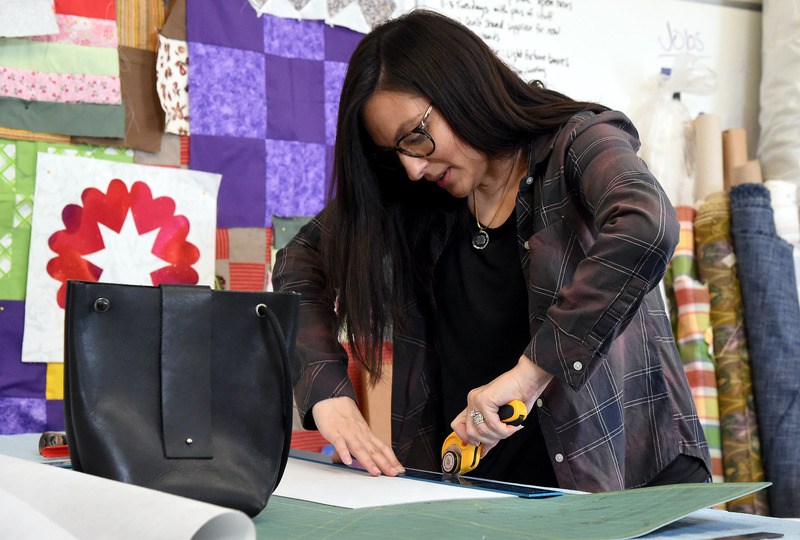 Our kits include felt and blocks, and students can follow the instructions to break down the blocks into smaller pieces, which can then be sewn onto a piece of muslin, so they can have their own quilt block,” said Bib & Tucker Program Manager Viola Ratcliffe. 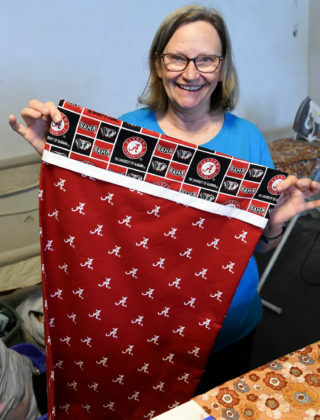 QUARK kits can be purchased at www.bibandtuckersewop.org for $20; for every kit sold, one is donated to a Birmingham City Schools student. 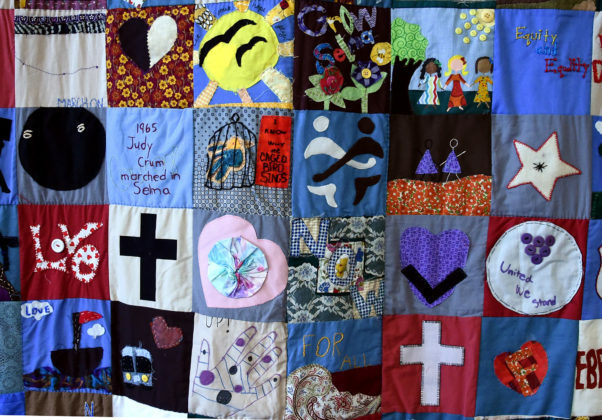 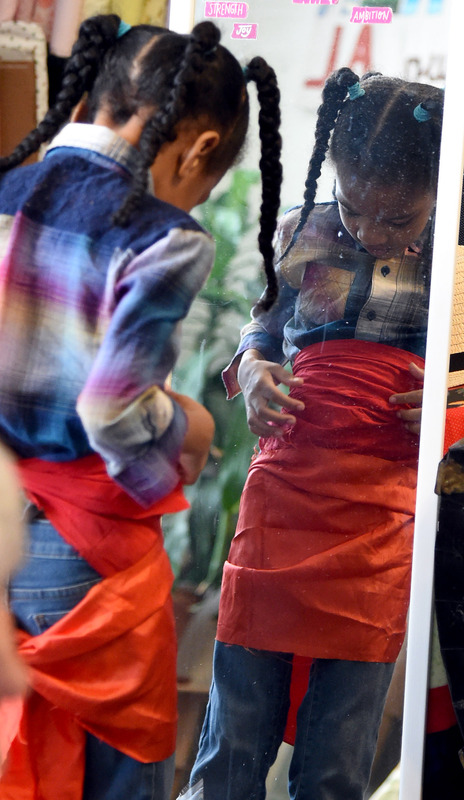 With Bib & Tucker’s other youth programs, the primary focus is making sure the arts of sewing and quilting are taught to young people through Jr. Membership. Participants meet one Saturday a month during the school year to learn new skills. The sew-op also conducts a week-long summer camp and hosts birthday parties. 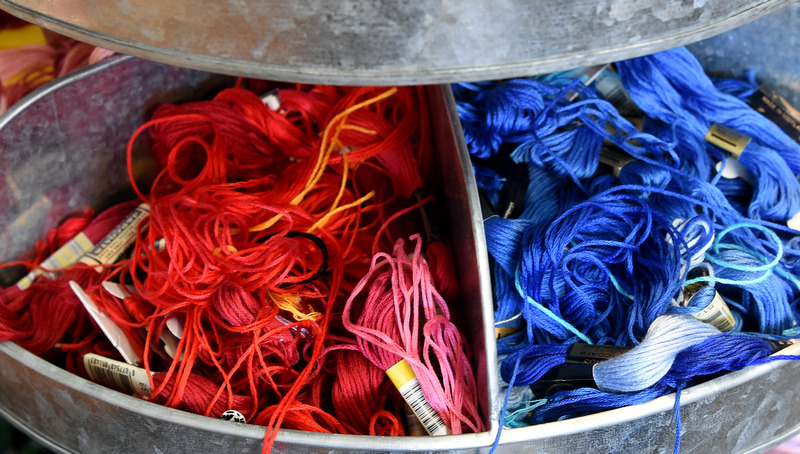 Ratcliffe believes one way to teach is by making a connection with something to which young people can relate. This program, one of the sew-ops biggest, runs through October. Business owners or designers can work on not only their own products through the program but also Bib & Tucker’s line of home-good items, which consist of pillows and quilts, and learn how to sew those items. This fundraiser is held every year; this year’s will be held on November 15 at the Saturn event venue in Avondale.